Flying into Tromso I knew immediately that I was going to love the place. On the grand scale of things the mountains are not actually that big compared to the Alps or Rockies but the most stunning thing about the place is how they just pop straight out from sea level and some rise up to about 1400m. I am not a big fan of the sea(sailing , swimming etc..) but I do like being near it and miss that a lot in Chamonix so Tromso ticks all the boxes. It really did remind me of all the best areas of Scotland....Glencoe , Skye , Torridon , Arran. All squeezed into one place and with fjords all over the place. I landed on the Wednesday and after quickly checking into my hotel I was out the door in no time to go and explore. I headed up to the race start area and ran out the first 10km of the course. It was getting late in the day(10pm) but it didn't feel that way due to the 24hr daylight which was awesome. The weather wasn't that great but I got some views around and it was good to scope out the first little section of the race. I took it real easy and was out for 20km with a little over 700m of climbing but I could have stayed out a lot longer! The next morning(Thursday) Kilian and some friends were heading out to mark the furthest away section of the course and asked if I wanted to go along and check it out so I jumped at the chance to scope out the most technical part of the course. 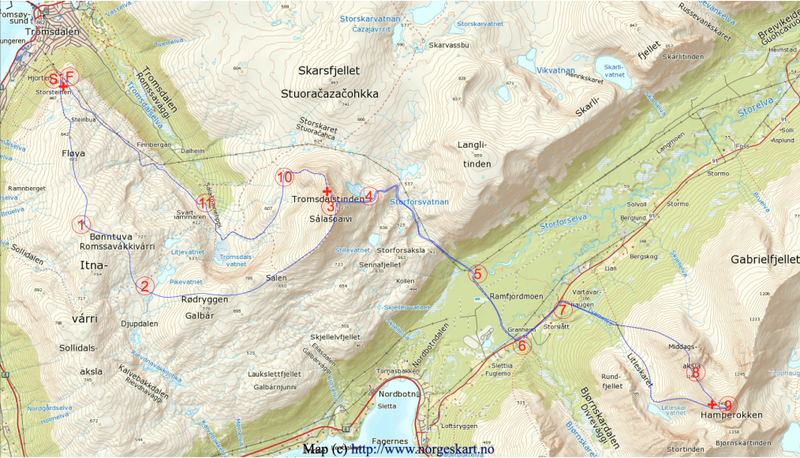 So the loop we did was the climb up and along the technical ridge to the summit of Hamperokken(1404m) then down the steep couloir(epic snow descent!) off the side and back around to the car. 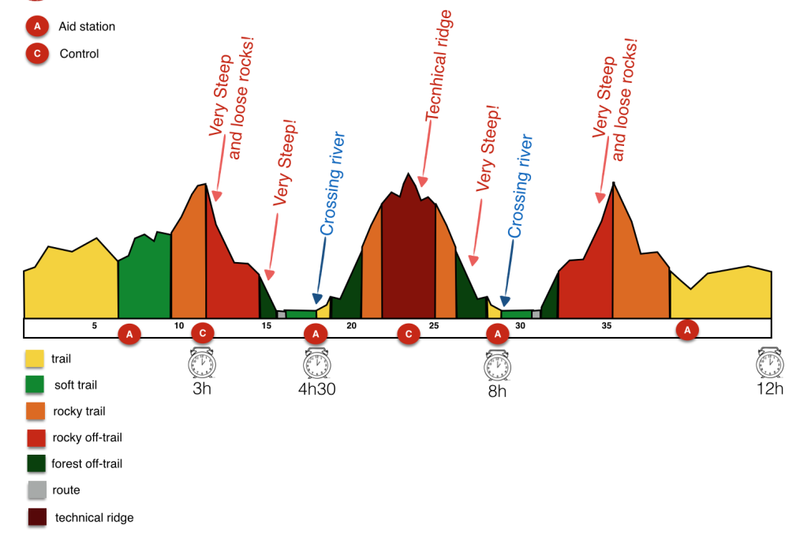 It's a 10km loop with 1400m climb but not your normal 10km! I will explain this section more later when I get to race day but it was bloody excellent to get out with a group of people to have a laugh and mark the course. Friday was the day of the vertical km race and after much pondering I decided not to run and save my legs for the Skyrace on the Sunday(which I think was a very wise move) Instead I arrived at the start an hour early and asked if any help was needed to which I was pointed over to a ten litre bucket of water and told it was needed at the summit if I fancied it. Being the idiot that I am I picked it up and off I went up the steep , techy climb of 1000m with what felt like a bag of lead on my back. I was absolutely pouring with sweat when I arrived to the summit but I did enjoy the way up. In hindsight my legs would probably have felt better if I had just ran the race. I took just over an hour for the hike with that weight on my back so I reckon I would have hit the low to mid forties if I had raced. The winner was in the ridiculous low 30s! Saturday was rest day and a group of us just wandered Tromso eating , drinking and just generally being nervous thinking what was ahead the following day. On paper 45km these days doesn't really seem that far. It's never easy but it is a manageable distance.Throw in 4400m of climbing and descending , only 4km flat running(zero tarmac except 10 metres to cross a road) lot's and lot's of technical terrain , scrambling , steep and I mean STEEP forest , rough trail less mountain side , snow and multiple river crossings and you got yourself Tromso Skyrace and it is bloody amazing. Last years winner took 6 hours 40 mins to finish! Just to surprise everyone the race starts and finishes at the top of a little hill that has a telepherique up it. The catch was the race starts at 10am and the lift opens at.....10am! So the warm up was a 3-400m hike up to the start which was taken very very steadily. On the descent off Hamperokken. Steep! I had been changing my mind constantly whether I should carry a pack or not for the race or just take my waterproof and shove a hat and gloves in my shorts. The weather was not great but it was not horrendous , it was very foggy and wet but it was not windy or that cold. As it turned out Lucy had got a nasty injury sliding on snow the day we marked the course and unfortunately she ended up not being able to race so I gave her my bag with poles and an extra warm jacket and she went to the checkpoint that I would pass at 17km and 30km to give me what I needed. So I set off with just my jacket , hat and gloves and a few gels in my pocket. My water source was the abundance of rivers I would pass on the course. Normally on 45km I would carry nothing but normally 45km on trails would take around 4-5 hours not my predicted 9-10 for this race. I hate the start of a race , finding your pace , feeling like your legs are not ready and so on and so forth but I battle on until I start to feel some kind of rhythm. The first 6-7kms went just fine. Lot's of rolling hills on some nice soft ground. Then the slow climb starts up to the summit of Tromsdalstinden(1200m) this again went just fine for me and I was on the summit sooner than I expected. This was the easy part of the race. From the summit I was pointed by race officials to the edge of the mountain with a load of snow disappearing into the mist at a rather steep angle. I had one look and turned back and shouted "down there!?" with lot's of laughter and smiles I got the response of "yup , enjoy!" Just as the snow started there was a rope put in place to steady yourself , there was steps in the snow and really the rope was not needed for getting down it but after about 50m the snow ended onto a bit of ice then onto the stupidly steep grassy , rocky , pathless mountainside so the rope was a good idea as if you had slipped on the snow then you were not gona stop even when you hit the grass. Then it was a long descent all the way back down to sea level on steep grass , more snow , a few very cold rivers to cross and then THE forest section. This was an absolute laugh. You couldn't go wrong here as the trees had been cut in to make the only way through so you just had to follow the only way you could go and by god was it steep in places. I was laughing out loud and bloody loving this bit , sliding down mud and hanging off of branches. It was so much fun and I actually managed to pass a few people down here who were being a bit cautious. After this comes the only flat section of the course. 2km in forest but with much more spaced out trees. This too was fun. Pathless soft terrain with markers on trees to keep you in the right direction. Again there was a river crossing but luckily there was a fallen down tree to use to get over it. I arrived in the 17km checkpoint feeling great and I was greeted by Lucy who was as hyper as ever. I just kept saying how much fun that was. I grabbed some water , decided to not take my bag or poles because they were not actually at the aid station for me due to a car breaking down which had all my stuff. Nothing I could do and I was not feeling cold anyway so I just had to get a move on and make sure I stayed warm. So back to the loop I had previously run on Thursday. I was not feeling my usual self for the first 900m up but I knew once I hit the ridge I would move quicker. Once I gained the rocky ridge I felt better and got my head down and tried to pass people I knew I was quicker than on this kind of terrain. It was wet a pretty slippy but never really bothered me too much and before I knew it I was just below the summit and ready for the final 50m steep scramble to the summit of Hamperokken. It was wet and care required but it is never hard. I would say the whole ridge gets harder and harder as you go along but most of it you can do without using your hands if your comfortable on that kind of terrain. There is one very exposed narrow section but it is still just a walk albeit a walk you do not want to slip and fall to your left. The final climb to the summit I would say is Scottish grade 2 or maybe easy grade 3 due to it being wet. 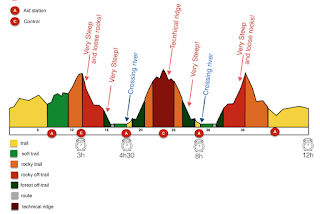 It is no harder than Curved ridge(grade 2) but easier than North Buttress(grade 3) If you are a runner who has never scrambled or climbed then it would certainly be very interesting but if you climb or scramble or do general mountaineering then you will just love all of it. I would say the descent is more serious than the climb up. It was back down off the summit and then into a large loose couloir which is very hard to run on. Then onto a huge 200m patch of snow which was the scene of Lucy's accident. I slid down here pretty steadily but again if your not used to running down steep snow slopes then this would not have been fun for you. You really don't want to get out of control and go off the end of the slope into the rocks. After the snow I was feeling good running round past the small lake and then across the boulder field. It was then back down the awesome smooth trail to the checkpoint at 30km. From here you head back up the first descent to the summit of Tromsdalstilden and from the summit you take a different route back down to the finish. So back across the 2km flat section and then fun time again. Going back up the steep forest was as fun as running down it. Sometimes I was clawing at the mud and trees to pull myself up. Just so much fun. Then back across the rivers and up up and up. The final 400m to the summit are ridiculously steep. Steeper than anything I have every experienced in a race. I was so happy when I seen the snow slope ahead as I knew it was only another 50m to the top. I hauled myself up the snow and was greeted on the summit by the happy cheering race crew. Visibility was pretty bad here and the descent down was quite tricky as I kept having to stop and look around for the next marker as to not go off route. The course was amazingly well marked but the fog was pretty bad by now. It's was kind of a trail for the top section but very very rocky. Once the rocks started to disappear it was very runnable smooth trail and open hillside and I was feeling great and going as fast as I could down here. I reached the next checkpoint at 38km sooner than I thought. I grabbed a gel then headed off to the finish. The next 6km are lovely smooth runnable trail all the way to the finish and I managed to run all of this as it climbed up again for about 300m. I ended up finishing in 8hrs 08mins and in 30th position. I think around 200-250 were signed up for the race but only about 120 finished and I am not surprised. It is a very very tough technical course. 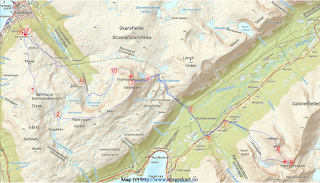 I would not recommend you sign up for this as your first race but one day everyone who runs in the mountains needs to do Tromso Skyrace. It's just amazing fun and the runners , organisers , supporters are all just awesome. I thought it would take a lot to top the Dolomites Skyrace but this totally beats it and easily. The whole atmosphere was unlike anything I have felt at a race. There really felt like there was no us and them with normal runners and elites. Even though the gulf in class is quite apparent when you look at results(1st 6hrs - last 14hrs) everyone was just chatting and sharing stories with everyone and I really hope this race never gets so big and loses this great atmosphere but I am sure Kilian , Emelie and Raf will do everything they can to keep it the way it is right now. I struggled for sure on both of the big climbs which is worrying as I have trained a lot on climbing this summer. It was slow going but I am super happy with how I raced and that I carried minimal gear for 8hrs out in the mountains and I never got any cramp , blisters or felt too bad. I wish I could have been a little faster on the last ascent but overall I am happy with how my race went. I need to keep reminding myself that this was a Skyrunning World Series race , the competition level was very high with a lot of world class runners. Sunshine would have been nice to enjoy the epic scenery but the fog made it atmospheric to say the least. I just want to put a massive shout out to everyone I hung around with over the weekend and all those who made this race really something special. Kilian , Emelie , Magnus , Raf , Stu , Dan , Lizzie , Mick it was an absolute blast. Finally a big shout out to Lucy who I know was devastated she had to pull out but she was around all day cheering people on and even at the end I hung around for hours with her cheering in the last runners and keeping spirits high. See you next year Tromso. I cannot wait.